To create qualified sales opportunities, content plans need to make sure that customer education is part of the mix. Your target market can’t buy if they don’t know the solution exists, and they are unlikely to buy if they don’t understand how the solution works. I’m not talking about content that educates website visitors about your particular product or service—feature set explainers or demos, for example—although these may be an important part of your overall demand generation work. I’m talking about content that leading brands use to help prospective customers get more conversant in, more thoughtful about, and more skilled in the issues facing their industry. Customer education content is particularly important for B2B SaaS products built on emerging technologies. Innovation carries with it the risk that a company gets “ahead of the market,” so some of your overall content mix should work to bring the market along with you. For example, artificial intelligence, machine learning, predictive analytics, chatbots, and blockchain are just a few of the technologies that companies are baking into exciting new products. The AI market alone is projected to have a compounded annual growth rate of 53 percent through 2020, according to the research firm Markets and Markets. But these technologies also introduce new knowledge deficits for buyers. Suppose I’m responsible for human resources for a mid-size company. If I’m being offered a new applicant management tool, promising it’s built on the power of predictive analytics, how am I supposed to make sense of what that means, let alone advocate for it with my boss? These tools all promise to improve learning outcomes using technology under the hood that may baffle the faculty, instructional designers, administrators, and workforce development professionals who influence the buying process. Even without unfamiliar new technology, products within a category may differentiate on other highly technical factors. For example, a product may use a range of open and closed technologies that impact the internal resources the buyer will need to think about. Or the competitors in the product category may have variations of fee-based, subscription-based, and revenue-share business models that may influence the end user experience. Similarly, the transition from installed to cloud in B2B software doesn’t just mean the software resides in a different server. The transition to cloud matters because it creates new business models, cost structures, features, and strategic opportunities that users may not fully grasp. Educational content that helps prospective buyers understand those opportunities should be a regular part of the content mix for editorial calendars, alongside thought leadership pieces and top-of-funnel pieces that try to generate awareness and enthusiasm. 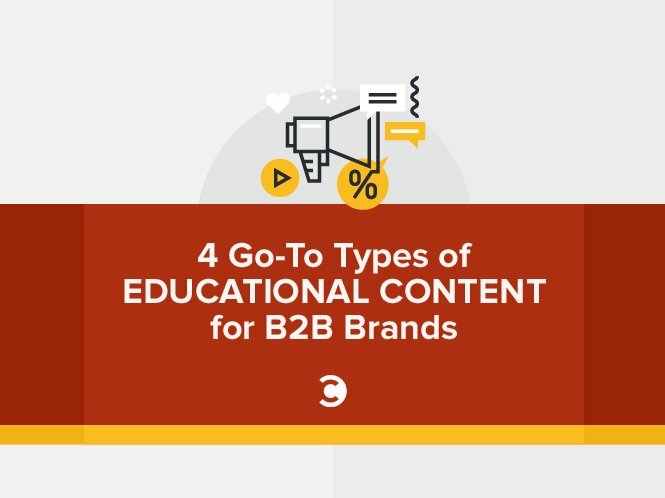 Below are four go-to types of customer education that you can build content around. And many SaaS companies are pursuing buyers embedded far below the C-suite who don’t want to watch industry trends—they just want to solve a business problem for their department or team. For example, IBM recently launched Content Hub, a “cognitively infused” content management software built on Watson. But instead of targeting the large enterprise market, it is priced to and designed for individual users within those companies who want to move quickly. Making the familiar strange means taking the old processes and products customers already use and showing them something amazing they can do if they introduce a new element. The audience is prospective users excited by opportunities for change and ready to shake things up. Meeting customers where they are is essential to this mode, but you shouldn’t be too cautious, either. You may feel that efficiency is nice, so a button that will generate the hated TPS reports instantly would be cool. But even better is a button that makes the TPS reports meaningful after all these years. That’s making the familiar strange. A case study about an existing customer is one example of customer education in this mode, especially if it outlines a new use case that grows out of integrating the new product into incumbent tools or processes. While you want your content to establish you as a thought leader, part of leadership is looking over your shoulder sometimes to make sure you have willing followers. When new products have an early awareness level, but there is an absence of complete understanding, people will fill the silence with questions and grumbling. “Where is this guy taking us?” Some will respond with fear, and those narratives can catch on if brands have to work to fill the void. This can be an issue for users of legacy services no one loves, like taxi riders afraid to try ride-sharing apps. It’s even more of an issue for beloved institutions with a lot of tradition. The college classroom, for example, is a treasured space. No one wants a strange new element to jeopardize it. So edtech companies have to confront a narrative that has emerged of a “robot teacher in the sky” that will replace teachers and diminish the student experience. Customer education in this space is often about showing that, on the contrary, a given product category can empower teachers to do what they do best. For example, content here might show how a strange new advising technology may free up faculty up from figuring out student schedules, so they can spend their office hours on tutoring and mentoring. This kind of customer education content is more ambitious but may be more necessary. You can’t market to a customer base that doesn’t exist yet, so it may be up to you to cultivate it. Some companies don’t need just to build brand awareness; they need to build awareness of whole product categories. For example, what’s the market today for self driving cars? Or for 3-D printers? Those are cool, but how many people are in the sales funnel right now? Not that many, but investors and companies are betting on the market being larger in the future. Those companies could wait for the market to grow organically, but they can also take control of their own fate by educating prospective buyers about the category itself—about what a self driving car or 3-D printer is and what its benefits are. My colleague Karen Singer rounded up some great examples of thought leadership content, and one of my favorite examples of this is Redshift, a branded microsite published by Autodesk, the maker of CAD and other design software. Redshift covers “the future of making things” through subjects like generative design and robotics. In other words, they are using content to inspire more people to get excited about 3-D printing technology, thereby growing the market for Autodesk. The previous mode of growing the market is like increasing the number of fish in your pond. Growing the ecosystem, however, is like nurturing the range of species that the overall health of the pond depends on. Good content can contribute to that also, although customer education here is probably a misnomer. It’s really educating your strategic partners, using content to attract them to the environment and to help them thrive in it. Many products depend on the success of other companies in the ecosystem. For example, Ford Motor Company would have evolved very differently without Firestone alongside it. Not only did Ford need customers to understand the horseless carriage, but it also needed manufacturers of tires, steel, and other materials and parts to understand the emerging product. This is familiar to anyone who is on the seller side of a two-sided marketplace. Udemy, eBay, Amazon, and AirBnB all have educational content to attract and support the strategic partners who actually put products and services on those platforms. The best example of this kind of content that grows the ecosystem are the developer communities cultivated by many platform companies. Take IBM Watson again, which benefits from a blog especially for developers that helps nurture the skills required to incorporate Watson into their applications. Given the platform approach of the Watson business model, if there were no app developers, there would be no applications and no market. Growing the ecosystem is a strategic necessity. I’ll close by briefly mentioning two other kinds of customer education that help establish a foundation for mutual understanding. You can help your target customers get better at their jobs. Content here is less about what you are offering and more about what they are doing. The cloud-based graphic design software Canva publishes an excellent Design School microsite that helps designers get better at what they do. It’s not introducing a new product category or shaking things up—it’s just helping people improve the skills they would need to use any design software. And you can educate customers about your process. This is really a form of pre-boarding or pre-qualification content for prospects who are further down the sales funnel. At a certain point, questions will come up about how you will work together. The questions aren’t, “How does this feature set work,” but, “How does this relationship work?” A lot of this will be handled in sales calls, but content that reassures prospective customers can help ensure you get to the call. As you already know, buyers have shifted to educating themselves via Google search and getting most of the way through the buyer journey before sellers ever know they exist. That’s why it’s so important to have your brand associated with trustworthy and authoritative content during those learning stages. Most tech companies already use content to grow their user base. But if your product or service is working with cutting edge and unfamiliar tech under the hood—or makes new use cases possible—then the next time you look at your editorial calendar and marketing funnel, make sure that you are using these customer education modes to help your customers get smarter. Robert McGuire operates McGuire Editorial Content Marketing Agency, which specializes in B2B SaaS companies. Connect with him on LinkedIn.